So I wrote a post this week about 100 Great Twitter Tweets. To do that I had to look at about a gagillion tweets to find 100 great ones. 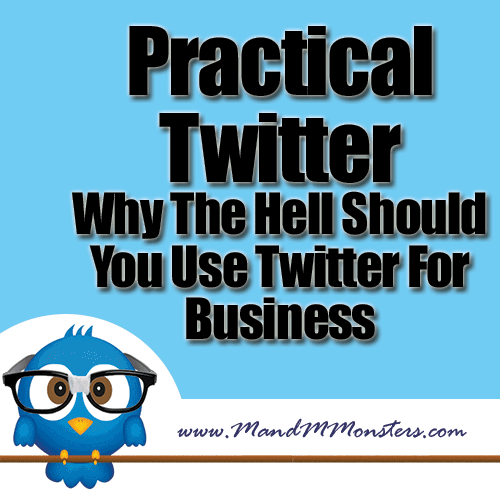 While doing all that research I figured out some things that may seem basic, but if you add them to your Twitter marketing mix, may help your efforts immeasurably! Why did I cuss in the title? Well I spend A LOT of time talking to small biz owners who think that Twitter is the dumbest thing they ever heard of. They are horrified that I expect them to spend even ONE SECOND on this silly little social network. That said, we get a lot of traffic to our websites and email list signups so I KNOW that there is value in doing the Twitter, IF you do it right! Save room for retweeting. People are lazy and they will just hit retweet without making sure your whole tweet gets posted (generally whacking off the link to your website). Have room for them to include your twitter name AND 4 extra characters..the space, the at sign and RT. Special characters part one. Using things like CAPS, Exclamation Points, …dots, and other F.U.N.N.Y. looking words made it SO much easier to see the tweet! Special characters part two. DO NOT overdo it! I am immediately turned off when I see something like this…#RETWEET THIS! FOLLOW ME & EVERYONE ELSE THAT RETWEETS THIS FOR 50+ FOLLOWERS FAST! #TeamFollowBack. I know that they are just spammers and trying to con me. Stick to one fabulous thing each post. Use You. When you are tweeting it is easy to think that you are reaching the world so you should say “you guys” or “hey all”. Unfortunately, EVERY person reading it is doing it alone on their phone or computer so you are seriously shooting yourself in the foot. Stick to saying YOU when posting tweets. How to get retweets. I read a great report about how to get retweets, (The Science of Retweets), while I was writing this and even though it is somewhat dated (2009) there are some really good universal ideas there! That said, it is true that if you can get great content out there it WILL get retweeted. Grow your following. I have over 17,000 followers on my @taradactyl account and I get a great response. Part of that is because I started a while ago. Our @MandMMonsters account has fewer but is growing because I work on it each week. The easiest way to get followers is to follow other people. This is one is slow and steady wins the race! Post about blog posts, infographics and videos. If you do a [Blog post] before your tweet it shows that it is not some kind of creepy sales pitch. DO NOT mix your message. I know we all have different likes and interests, but on social media you only get one chance to make a first impression. I will tell you, I check out a person’s feed to see what they are talking about and if they are all over the place, I rarely follow them. I want people to be one thing (such as a scrapbooker, email marketer, social media, denver local). If they are not, I really don’t have time to sift through to find what will interest me. Save your amazing variety of a life for your “real” friends. Mix it up! Don’t just post your content. Retweet other great content you find. Have 80 percent information and 20 percent sales (and by sales I mean anything that requires a signup or a form to be filled out to get the info). using twitter marketing for your busness online is amazing, infact using any social media for online marketing is just amazing. If you dont then your missing out!